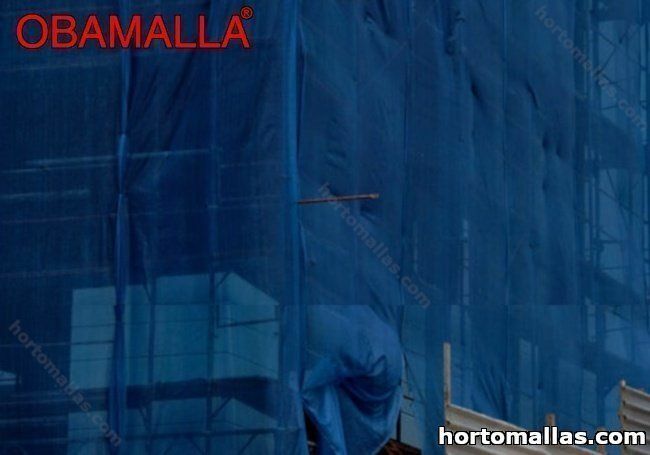 Shade netting for construction is a knitted polyethylene monofilament, which was thought-out especially for providing protection for scaffolding while construction is underway, thereby preventing potential damage to people and property (cars, sidewalk benches, etc.). 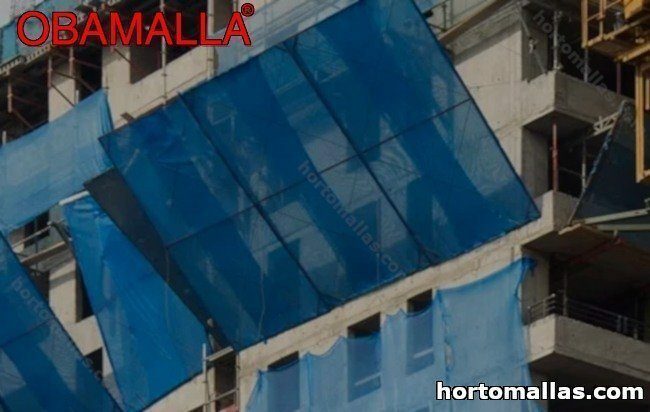 Especially in the case of buildings under construction that are exposed to high-volume pedestrian traffic, shade netting for construction gets used to prevent the possible fall of debris and rubbish and to contain dust, sand, and stones. 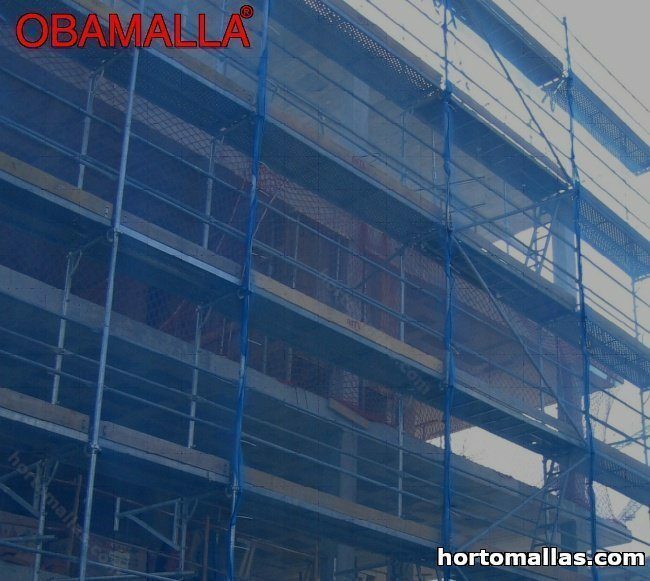 The simple fact of the matter is that shade netting for construction is obligatory when the nature of the construction will result in the generation of dust in the workplace environment and inconveniences for populated areas in the construction site’s proximity. HORTOMALLAS offers an ample choice of netting for scaffolding, fences, and barricades for construction sites. Shade netting for construction is extraordinarily economical and can be used as a single-use netting in order to provide scaffolding with a new barrier for each new construction project, but it can also be reused for a number of construction projects and it is easy to store between uses. What is being discussed here is a lightweight, flexible, and easy-to-handle material that can also easily be stabilized to prevent it from billowing like a sail, using a simple cabling system. Anchoring the netting is especially important in windy zones. For such cases, it is recommended that a study be done of the direction and intensity of the wind gusts. When correctly installed, the netting serves as an effective windbreak and as a barrier for objects carried by the wind. At the same time, it is permeable to allow for a controlled amount of air flow and diffusion of light. It is the most effective solution for closing up openings that are part of the construction. What is being dealt with is a safety net to prevent serious consequences from accidents which is made of very tough knitted material. Shade netting for construction, as shade cloth, not only provides protection from the sun and high temperatures, but it is also an effective windbreak. As a privacy net it also provides appropriate privacy for construction projects and workers if the project requires it. It assures an agreeable aesthetic for the building under construction with its surroundings. Una de las ventajas de la malla sombra es que además de proteger las zonas de construcción de sol y del calor también las protege del viento. Shade netting for construction gets put up to protect the surrounding area from intense contamination by the dust which is created when construction is underway. This is a means of maintaining a cleaner environment. It also answers one of the demands of the norms pertaining to the construction industry. 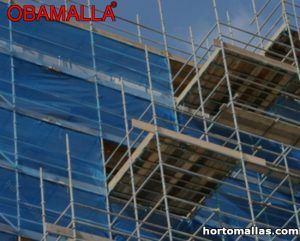 Safety net for scaffolding has a degree of shading which will lower the temperature in the work environment. Thus it provides shade and protection for the construction workers, improves their well-being, and helps to optimize working hours. It does, in fact, prevent sunstroke and discomfort caused by high temperatures from being in the sun. At the same time, the knitting of the fabric allows light and air to pass through. This makes for protection that also allows for air flow and lower relative humidity. 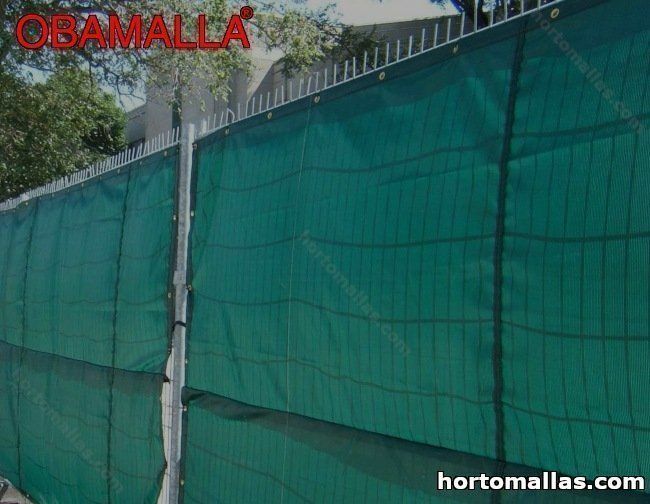 The netting is available in different breaking resistances and different shading percentages according to the client’s needs. Otra de las ventajas de la malla sombra es que disminuye la humedad ademas que se puede encontrar en diferentes sombreados para adaptarse a las necesidades del cliente. The roll can simply be unrolled from one end to another and then the sides and ends fastened down. Especially in windy areas, one can plan on using wire rope. The safety netting should be anchored by means of cables on the perimeters with respect to the supporting structure. The netting should be positioned so that there are no openings greater than 10 cm (4 inches) between the edge of the netting and the structure. Replace in the case of a tear in the fabric, a break in the fastening cable, when one finds an excessive abrasion, etc. Be sure that the supporting structure is solid and not too flexible and that it be an adequate support for hooking the netting to it. Fasten the netting to the support structure using a cord rather than hooking the netting itself to the support. Be sure that the ground beneath the netting is free of obstacles of any kind that might reduce the distance to the ground or prevent the netting from stretching fully in the case of a fall, or that the net might catch on or cause damage to the net. Se recomienda agregar cables de alambre para darle una mayor estabilidad y aumentar la seguridad en los lugares más ventosos. We can supply the shade cloth complete with grommets on the perimeter and reinforced edges, ready for installation. We can also manufacture custom sizes according to project needs. 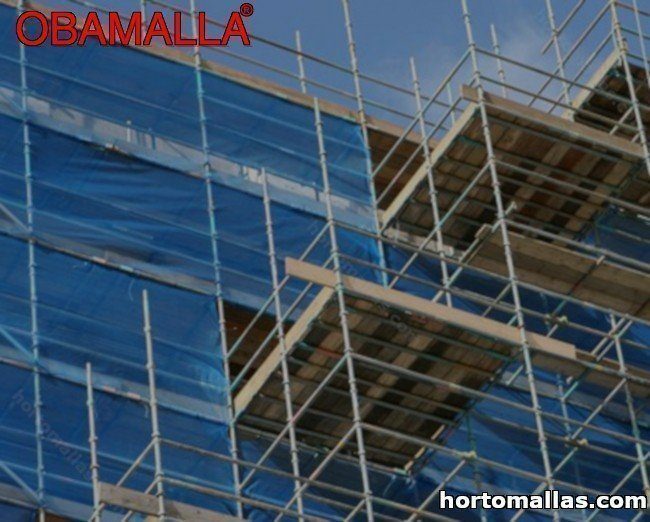 Our net for scaffolding resists wear, being sufficient for protecting against falls. It will not fray and is more tear resistant than other materials. The UV-stabilized, polyethylene filament and the process by which it is manufactured, are guarantees of durability. Many plastics in their natural state, are vulnerable to UV radiation. The fact of the matter is that materials made for outdoor use can be subjected to severe weather conditions. In order to be exposed to the elements in a secure way, safety nets should be UV stabilized. Una ventaja mas de la malla sombra para los andamios es resistente a los rayos UV. Toughness and durability are generally achieved by means of the use of additives such as UV stabilizers and black dyes (usually black carbon). Treating with stabilizers and additives is quite effective for protecting plastic materials, including netting, from UV rays. By itself, the use of robust and long-lasting materials, like high density polyethylene, guarantees excellent resistance to atmospheric agents and UV radiation. La malla sombra para andamios es buena opción ya que cuenta con una alta durabilidad y resistencia a los rayos UV y a los agentes atmosféricos. Our UV stabilized plastic nets do not show change in appearance or in mechanical properties, such as discoloring, cracks from stretching, and reduction of mechanical strength, elasticity, and durability. Plastic shade netting for construction is definitely a highly recommended resource for covering scaffolding and increasing safety at construction sites.